Today might be “Alien Day” in recognition of the scifi horror classic, but it’s actually tomorrow that a fascinating new layer of this universe gets uncovered in the new comic Aliens: Defiance. Set nearly two decades after the events of the first movie, Defiance follows a Colonial Marine named Zula Hendricks and a group of Weyland-Yutani synthetics on a mission that, of course, leads to them encountering Xenomorphs aboard a creepy derelict ship. Faced with a horror she’s never seen before, Zula finds herself questioning her loyalties as well as everything she knows about what’s out there in the darkness of space—but she has to survive her encounter with the deadly aliens before she can act upon her feelings. 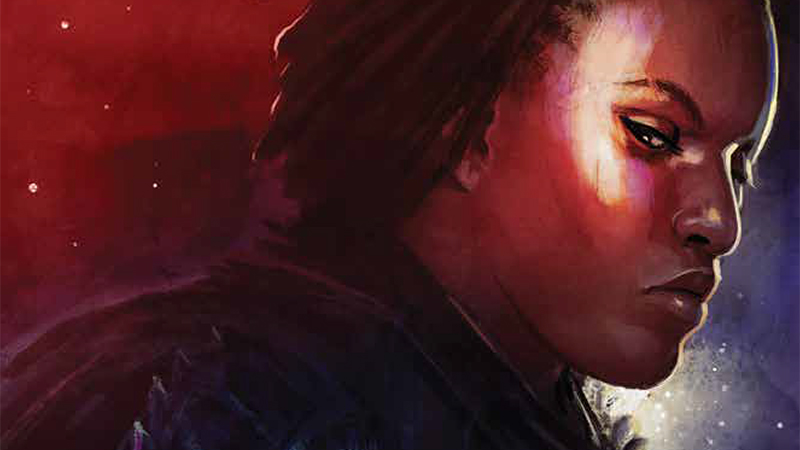 We spoke to writer Brian Wood and series artist Tristan Jones (joined by Dan Jackson on colors) about the new Dark Horse comic, the subversive nature of their lead character, and what makes Aliens so perfect for the medium. Check it out below, as well as some exclusive concept work from the comic itself. io9: Brian, tell us a little bit about the set-up for Defiance. Brian Wood: It takes place about 17 years, give or take, after the events of the first film. Which also means decades before the events of the second film. So it’s pretty early on in the overall timeline, and pretty much no one on earth is even aware the Xenomoprhs exist. I suggest in the first issue of Defiance that Weyland-Yutani has a really rough idea that something’s out there, and it’s ripe for exploitation. And when this derelict deep space hauler shows up near Luna, they suspect it might be on board. This is what gets our cast—Zula Hendricks and Davis—onto that hauler to help guide it into safe harbor. Zula isn’t quite the typical gung-ho, badass Marine. How did you settle on going with something like this for your lead? Wood: I personally have a hard time watching the Marines in Aliens. I mean, it’s a great film and a lot of fun, but I think in many ways it’s a product of its time. That sort of gung-ho trash talking Marine feels very ‘80s Hollywood to me, and even the most seasoned Marine I know in real life is miles away from that stereotype. So from day one I was determined to not go that route, and instead create a very young Marine that in no way could fit that stereotype. I also needed someone who could be both a Marine but also have the perspective and moral center to turn and walk away from the Marines when she needs to. That’s the “defiance” part of this story. What’s been your favorite part of playing in the sandbox of a huge franchise like this? Wood: It’s all been very satisfying. I have two answers to your question: the first is working with Tristan Jones. The second is figuring out the puzzle of helping to create a modern comic book that is also a throwback to the original film, in terms of style, technology, and color palette. A lot of that is obviously working with Tristan and our colorist Dan Jackson, but I spent a lot of time watching and thinking about the original film, why it works so well, and adapting that to this project here. What’s the biggest challenge in writing an effective Alien story? Wood: Putting Aliens in it! What I mean is, creating a serialized story that can run for 12 [issues] (at a minimum) and keep that tension, that threat, and that fight for survival and sustain it. If you think about the films, the films are very finite: there are Aliens to kill and a path of escape. Do that and you’re done. With a serialized story, something has to be created to maintain a steady threat over time. It’s a challenge, but a fun challenge. What do you think it is about this world that makes it such perfect comic book material? Wood: I think it’s way beyond just comics. Aliens, in any form, just is that sort of storytelling that seems to be universal. It’s such a primal thing. It’s about fear—fear of the dark, of the unknown, fear of an unstoppable force, a biological fear, a claustrophobic fear. But contrasted with that is this idea that ordinary people can rise up to meet those fears and overcome them. That works for a 5-year-old and a 75-year-old. It’s potent stuff that works in comics, on film, in novels, in games—you name it. Aliens has an iconic aesthetic. Was it hard to stylize and design the look of the book because of that while trying to deliver something visually fresh in this familiar world, or was it something easy to embrace? Tristan Jones: The look was fairly easy to embrace. It’s hard for me because I’m not a trained artist. So I’m absorbing as much reference material as I can, but I love a lot of the science fiction that originated around the time of Alien, and it all as this lo-fi sci-fi look and feel—things like 2001, Silent Running, even the original Star Wars to an extent. Another godsend was having the video games we have now—Isolation and even the derided Colonial Marines, which basically let me move around the environments from the films and see what was what and get a good look at all this stuff. The guys from Isolation have been really great about reference material too. They seem pretty happy that we’re sort of reinforcing stuff they set in motion while we tell our story, too, so it’s great that everyone involved in building this universe is really in it together. Did you feel beholden emulating the movies in your work, or was more of a case of, “Oh my God I’m drawing an Aliens book, a shot like that has to be in there!”? Jones: This I think is more from my own background in film and television, which was pretty heavily driven by things I’d learned watching Alien. Framing certain things, lighting things a certain way—I think a lot of that comes from how I learned to tell stories through study. But when that comes face-to-face with page-to-page storytelling of comic books there’s a level of adaptation where you have to take what works and make it work another way. That said, the filmic presentation of it is definitely much more on my mind, and I don’t think it’s so much an attempt at emulation, I just think that there’s definitely a way that presenting these things works best, and it’s something Fincher did in Alien 3 without necessarily aping Scott, it’s just a language in the telling of these stories. I’m just doing my best to speak it properly! So yeah, definitely, certain shots should be in there, because that’s the language these things speak, if that makes sense. What is it that appeals the most about doing licensed comics? What drew you to Defiance as an artist specifically—beyond a love of the franchise? Jones: Licensed comics gives you a chance to be involved in something that means a lot to you, obviously, but also flex artistic muscles and challenge yourself, and good licensed gigs—ones that appeal to me most—do both. Mad Max was a huge challenge because it was essentially 12 Angry Men. [Ed. note: Jones provided art for DC’s series of Fury Road tie-ins.] Sure, it’s Mad Max, and sure, I was bummed I never got to draw Max or the Interceptor, but that world and those characters were interesting to me, and trying to make that comic visually interesting, when it’s literally 30-something pages of people talking in the same room, was a huge challenge. Aliens is a little different. Aliens is something I’ve geared my entire career towards working on. When Brian first approached me to work with him, I thought it was going to be something else entirely, but when he told me it was Aliens—beyond being on board immediately for the Aliens—the fact that he was writing it grabbed me straight away. And when a publisher has someone like Brian on a book like that, you know the publisher is behind this thing 100%, so a lot of the time decisions regarding the appeal of a project lie in who else is involved and what you can draw from that. With Mad Max it was because George [Miller], Nico [Lathouris] and Mark [Sexton] were all directly involved, which overrode the fact that I wouldn’t be drawing what I identified as the things I loved immediately about Mad Max. It’s similar with Aliens, except I get to draw all those things I love! If there’s one thing that you haven’t yet been able to draw from across the whole Alien pantheon yet, what would you love the most to get to draw for Defiance? Jones: Engineers. Right out the gate! Or a Predator. I think with what we’re doing with Defiance, there’s plenty of room to do some great things with both of those guys down the road and really make them terrifying. There are some great biological questions Prometheus raises about the alien life cycle and the biology that I’d love to explore and see what that affects visually. What happens when a pregnant woman is made host to the alien larvae for example? How does that biologically impact the creature it gives birth to? I find the idea of egg-morphing (something Scott had reinserted into the director’s cut of Alien) genuinely horrifying, and there’s something I suggested to Brian that I’m hoping we can do, because that will be as fun to draw as it will be grotesque. Those “Working Joe” androids are the creepiest things to come to that universe since the Alien itself and crazy fun to draw, so more of them! MORE! There you go, a bunch of things for the price of one! I also really love drawing Amanda Ripley [protagonist of Alien: Isolation]... nudge nudge, wink wink! Aliens: Defiance #1 is out tomorrow, April 27th.